You know, I’m not really a big proponent for teenage pregnancy. I don’t know anyone who really thinks it’s “cool” or desirable. I have to say, however, that I did like the movie, Juno. First off, the title character, Juno MacGuff, is honestly just a funny girl. She’s in a sucky situation, and she knows it…but she kind of carries herself through it with a good attitude, and makes the right choice (in my opinion) when she decides to go through with the pregnancy and give the baby up for adoption. Juno is very concerned that her child is given to the “right” home…no weird or lame couple will do. She finds the “perfect couple” in Vanessa and Mark, who seem to be happily married and normal, as well as successful. Vanessa feels like she was born to be a mother, and welcomes Juno into their lives. Juno seems to bond initially more with Mark, who has a lot in common with her. However, after seeing Vanessa’s interaction with a child at the mall, Juno is clearly convinced that she has found the right mother for her baby. 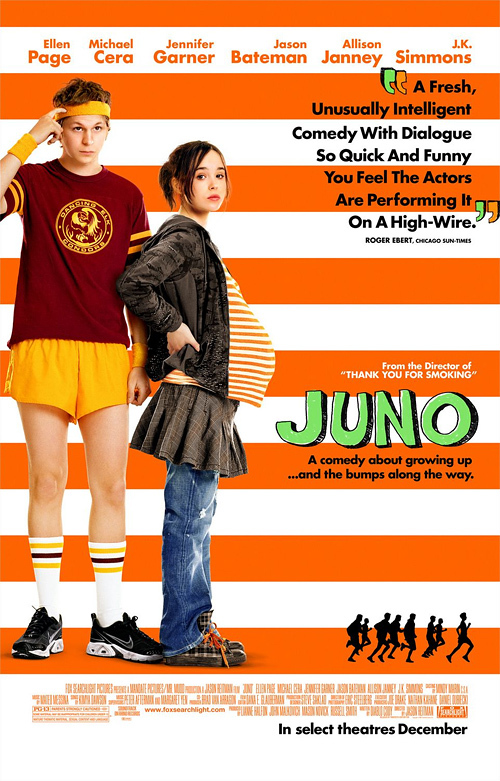 The movie basically follows Juno’s entire “journey” over the next nine months. We see how she finds out that she’s pregnant, how she tells her family and friends, and how she bonds with the Lorings. We see how she deals with ridicule at school, but always holds her head high and has a quick one liner for every situation. Things don’t always go the way that she plans them, but she rolls with the punches and does the best she can with the hand she’s dealt herself. Overall, the movie just made me smile, due mostly to the likeable (though sometimes awkward) characters. I am all for any movie that shows that good things can come from bad situations. Juno learns things about herself, builds a stronger relationship with her family, and realizes the importance of her true friends. And, when Vanessa is seen holding her child for the first time, I got a warm feeling that you generally wouldn’t associate with something as “ugly” as unplanned teenage pregnancy. Nobody likes clouds, but all of them potentially have silver linings…we just have to find them.